With the show under a month away, broadcast plans have finally been revealed for All In. The four-hour All In main card will air live on pay-per-view, Fite TV, and ROH's HonorClub (further details on this option have yet to be announced) starting at 7 p.m. Eastern time on September 1. 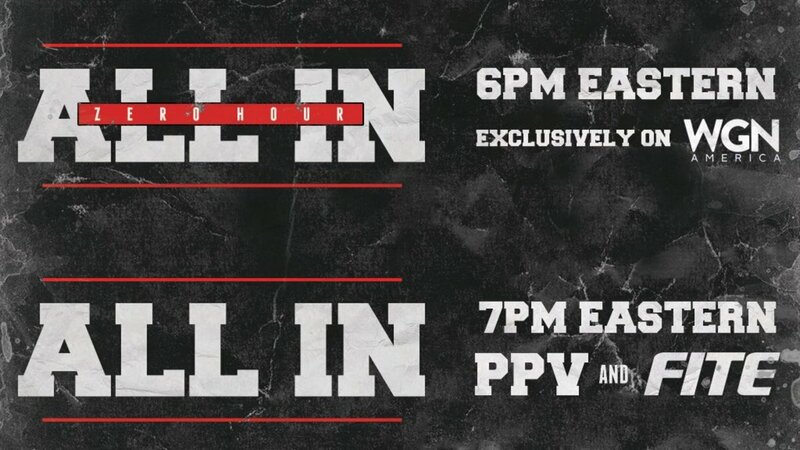 Before that, the first hour of the show will be called "All In: Zero Hour" and will air exclusively on WGN America at 6 p.m. Eastern. The rest of the event won't be shown on WGN. Fite TV lists the price at $39.99 with unlimited replays included. On today's Being the Elite, Christopher Daniels vs. "Arrow" star Stephen Amell was also added to the card for All In. They've been building to that match on Being the Elite, with Daniels unsuccessfully trying to frame Amell for the storyline "murder" of Joey Ryan. Kazuchika Okada vs. Marty Scurll, Cody Rhodes challenging for Nick Aldis' NWA Worlds Heavyweight Championship, The Young Bucks & Kota Ibushi vs. Rey Mysterio, Fenix & Bandido in a six-man tag, and Hangman Page vs. Joey Janela are the other matches that have been confirmed for All In. The show is taking place at the Sears Centre Arena in Hoffman Estates, Illinois.